Assume these plays already made. FredK: This sequence is discussed in Sonoda (p. 210). He dislikes it because it leaves White both alive and not sealed in. He gives several pages of variations more like the one discussed by Dieter, below, which leave Black squashed into a second line position. Charles Yes, this is an interesting topic. Ishida gives also Black at a, , Black cross-cut. But I'm not sure that occurs in real life. 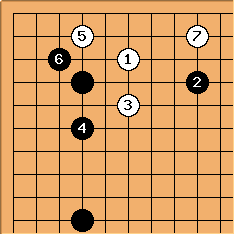 Black can also play directly at , sometimes. 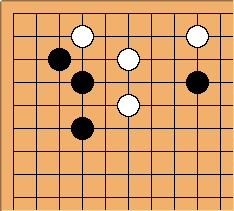 There is also the possibility of Black playing the peep here earlier, as soon as White slides into the corner. 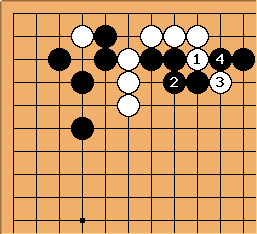 That will mean that White has a chance to play at a here, so there must be a reason connected with the upper side for Black to play this way. 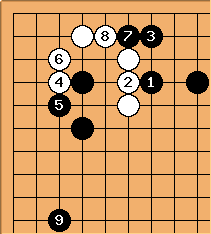 Later when whites corner is surrounded black has a trick. here looks like the modern style, but I don't know if it is good; it was once suggested to me by a 6 dan. 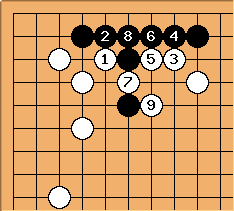 The honte is for Black to play at , to correct the thin position; this line shows what happens without that play. Please correct me, because I'm diagramming from memory and I haven't really checked its validity lately. 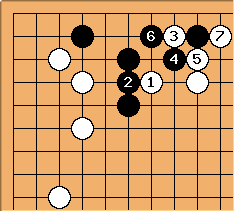 Black's stones are not easy to attack because White's group is also weak. Have I missed something? Charles It ought to be better to play at a, anyway: stronger towards the corner. Moved here from 4-4 point low approach, two-space high pincer with side stone. SnotNose: Not sure if pros play this nowadays (or ever) but it is often played by amateurs (at least up to 1 dan). SnotNose: Black has this annoying little follow-up that has led to some ugly play in the games I've seen. Other variations are possible ( at a, for example) but all lead to fighting and turns out to be very handy in the fight. 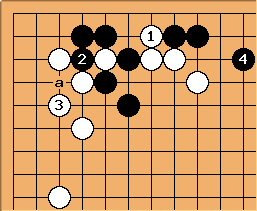 Alex Weldon: After this, White at b looks interesting to me, taking advantage of Black's shortage of liberties. 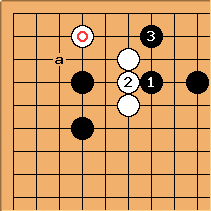 Charles Bad shape, aji keshi for Black. SnotNose: That's exactly what I thought too when I first saw this sequence (ugly shape, aji keshi, etc.). 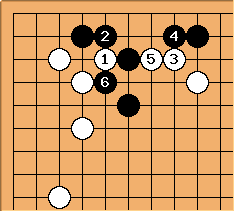 However, Guo Juan 5P has recommended it to some attendees of the recent US Go Congress. So, for that reason alone it is hard to dismiss too easily. 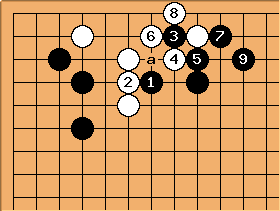 Moreover, if black is a strong fighter, this can be an advantageous way to play. I think the relevant question is: is the fight a fair one? 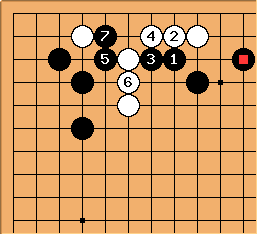 If it is at least fair or, due to board position or relative strength of players, tilts in Black's direction, then this may be an okay way to play, no? Other thoughts: bad shape isn't always bad. The aji keshi is due to the fact that Black could have cut White off from progressing across the top. 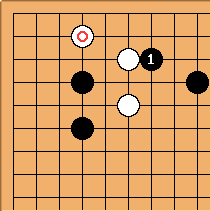 However, if the position is such that Black wouldn't benefit from limitting White at the top, then is it really aji keshi? That completes my thoughts on this sequence. I won't defend it any further. Charles I wouldn't dismiss it. 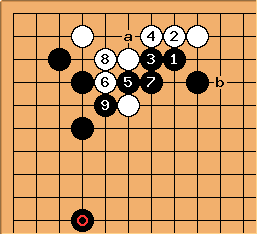 It turns out that Cho Hun-hyeon tried this in 1996, against Seo Mu-sang (colours reversed). The stone was present. This went to the / exchange. Black then pulled out the cutting stones, but in very poor shape. In fact Cho won this game, despite some serious dangosity.